Driving in France this summer? 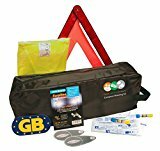 If so, Family Motoring & Leisure has teamed up with Amazon to offer a Good Quality European Motoring Kit, containing the essential legal requirements whilst driving in France, such as the “NF” approved breathalyser twin pack, GB Euro Magnetic Plate, EU Approved Warning Triangle, High Visibility vest – universal fit, Headlamp Beam Deflectors, Storage Bag. All of the above items are packaged in a convenient travel bag, ready to pack in to your boot. It is compulsory to carry certain items while driving through Europe and this kit will make sure you are well prepared for your journey. By not carrying these legal requirements fines could be imposed. Complete driving abroad kit ; all of the essentials needed while travelling through Europe.